There’s no doubt that color trends have influence on our environment. Remember the vibrant teal of the 1980s and the steely gray of the 2000s? What’s interesting is how color trends in interior design reflect the attitudes of the era as well as the users of the space. It's attitude is “life-affirming” and “nurturing,” according to the global graphics company. I can certainly sense the expressiveness of the orangey pink hue and how it brings to mind the shelter of coral reefs beneath the ocean. As a home for sea life, coral is literally a community of social connection. And don’t we all need more connection right now? At your retreat, camp facility or treatment center, the social spaces must signal an openness, while at the same time, offering a sheltering place where residents can feel connected without being overwhelmed. Your color choices can make that happen beautifully. Incorporating a trend color like coral into the design of common areas might seem like a challenge, especially for organizations that are accustomed to neutral earth tones. With coral’s boldness, the color might work well as an artistic accent, bringing a touch of energy to a group room or dining space. 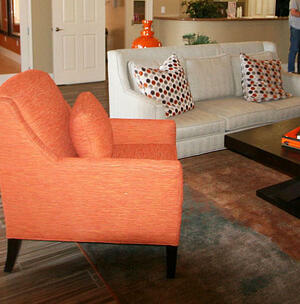 Our Tangerine hue from the Key Largo Vinyl Collection is a sweet coral color with a bright edges. It can add a sense of encouragement through design. Once you begin to pair it up with complementary colors, such as Pear in our Finale Woven Cry pton Collection, or a traditional mix, such as Shire Sesame in our tough Sherpa & Shire Upholstery Collection, you’ll see how it draws the eye and refreshes the environment. Your residents will notice the homelike quality of the lighthearted coral color as it breaks up what otherwise might be a muted space. There’s no reason to shy away from trends. As an equalizer of all the day’s visual inputs, color signals our minds as to the expectations of where we are and what we will encounter. Use it wisely for your residents.